Written by cwtemplate on July 17, 2018 . Posted in Community, Windows. One of the families who received a home. 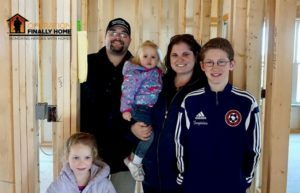 David Belman, owner of Belman Homes in Waukesha, Wisconsin, understands the value of hard work and dedication. As a kid, Belman’s father instilled those values in him. As hard as he’s worked throughout his life, Belman has been blown away by the dedication and bravery of U.S. military veterans. That’s why Belman Homes became the first Wisconsin builder to commit to working with an organization called Operation Finally Home, which builds mortgage-free houses for injured or fallen veterans and their families. It all started when one of Belman’s suppliers invited him to a concert during the International Builders Association show. It turned out to be a benefit concert for Operation Finally Home. During the event, a video was shown telling the story of Army Sergeant Stephen Jackel. While serving in Afghanistan in 2011, Jackel’s vehicle hit an improvised explosive device (IED), flipping the vehicle and crushing his legs. Jackel’s legs were amputated, and he had other serious injuries. The soldier returned home where he had a family with six children to care for. Belman learned how Operation Finally Home gives veterans like Jackel much needed help by providing a home their families can live in for free, relieving them from the burden of mortgage payments. Belman knew he wanted his company to become involved with the organization, but at the time Operation Finally Home was mostly operating in the southern U.S.
Not long after, during a Wisconsin Builders Association meeting, Belman heard the Structural Building Components Association (SBCA) was interested in doing a housing study and working with Operation Finally Home. Army Sgt. Drew Wroblewski and Army Spc. Bo Kitelinger with their families. In early June, two families of injured U.S. veterans will move into brand new homes in the village of Jackson, Wisconsin. 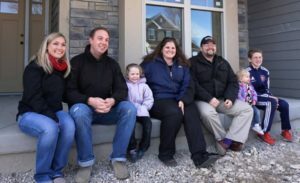 Belman Homes built a house for Army Specialist Robert “Bo” Kitelinger, and another Milwaukee area builder, Tim O’Brien Homes, built one right next door for Army Sergeant Drew Wroblewski. Both Kitelinger and Wroblewski are Purple Heart recipients who are now dealing with traumatic brain injury (TBI) and post-traumatic stress disorder (PTSD) after sustaining injuries during IED attacks in Iraq. What stands out about the stories of both men is not only the fact they re-enlisted and continued serving as long as they could, but that they are working to overcome the struggles of re-adjusting to civilian life so they can make a difference in the world. Belman says the builders are involved in selecting the families who receive homes and that Operation Finally Home purposefully seeks out veterans who are not only the most in need, but the most admirable. In Bo Kitelinger’s case, he sought help for his PTSD while applying to colleges around the country that were located near VA clinics. Kitelinger has been attending Marquette University and plans to move on to medical school so he can eventually practice sports medicine. Meanwhile, he’s been volunteering to shadow physicians at the VA Medical Center in Milwaukee. Belman says Kitelinger is also closely involved with a veterans’ support group at Marquette and referees for youth soccer games. When Belman met Bo Kitelinger and his family, he was impressed by their attitudes, which made the process of building a home for them even more inspiring. Army Spc. Bo Kitelinger and family at the Milwaukee Bucks game. The Milwaukee Bucks assisted Operation Finally Home in delivering that surprise to the Kitelinger family. Belman says they were able to announce the news at center court during halftime of a game last season. Belman says he’s enjoyed every part of this experience. During the process of building the Kitelinger’s home, the many suppliers and vendors who supported the project came to write messages to Bo and his family on the frame and walls. Neighbors in the local community also got involved, including local school children. “When Kimberly (Bo’s Wife) came in the house and saw the notes from the kids, it was just very emotional, and you could feel the love in the house,” Belman remembers. When Bo, his wife and their three children move into their new house, they’ll find a home custom built for them. It’s a four-bedroom ranch with around 2,500 square feet when you included the finished basement with a rec room. There’s even a special wall in the basement for the Kitelinger’s son who is a big soccer fan. Belman Homes also kept Bo Kitelinger’s needs, challenges, and comfort in mind. It’s quite apparent that David Belman is proud of the home his company built, and he’s excited for the Kitelingers to make it their home. The big day is June 4, 2016. There will be a celebration in Jackson, including a parade that ends at the two houses. Then the keys will be handed over to the Kitelinger and Wroblewski families. Belman says this won’t be the last time his company works with Operation Finally Home. Plans are already in the works to help another veteran with a mortgage-free home in Wisconsin. Pella Windows & Doors of Wisconsin is already on board and plans to donate all the windows for the next project. Belman says he is deeply thankful for the donations and support he’s received from industry partners so far. David Belman is a second generation home builder, and Belman Homes also operates as a land developer and real estate company. Belman Homes specializes in hand-built, stick-frame homes including custom cabinetry and woodwork, which gets finished on site. But not everything about Belman Homes is old fashioned. The company uses technology to create an exceptional customer service experience. Belman is serving as the president of the Metropolitan Builders Association, following in his father Don Belman’s footsteps. “My father was president in 1995, and we’re the first father-son presidents of the MBA. So that was a neat thing to be able to share,” David Belman says. Soon the younger Belman will move on to a new role supporting the industry. He is president-elect for the Wisconsin Builders Association. During his time in that position, Belman says he plans to work with the next generation of home builders in the state.